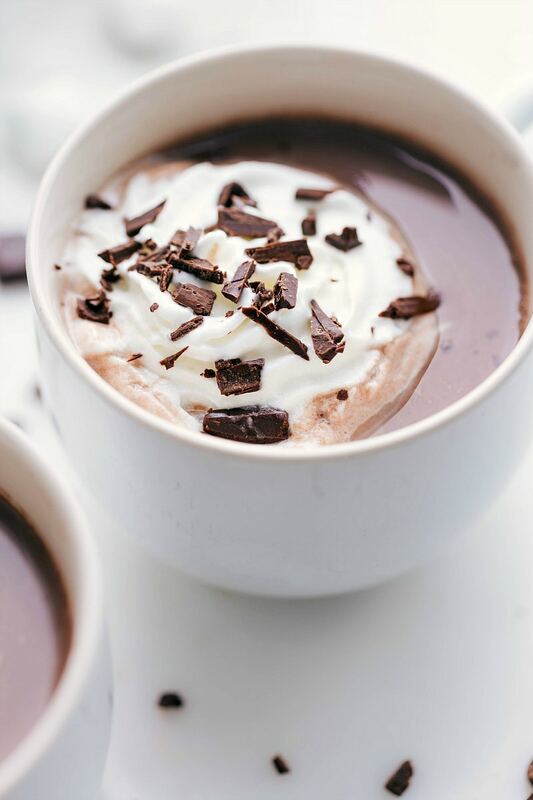 Creamy, dreamy hot chocolate — you’ll never go back to buying mixes or packets after trying this recipe and seeing how simple it is to make! Use this hot chocolate recipe to warm up on a cold day, as the staple for a hot chocolate bar, or alongside these perfect oatmeal chocolate chip cookies. Hands down, hot chocolate is my favorite drink. Come Fall and Winter I basically have a mug of hot chocolate glued to my hand at all times. Recently I’ve been going crazy with pairing hot cocoa and creme brulee together. Probably my favorite go-to treat at the moment! 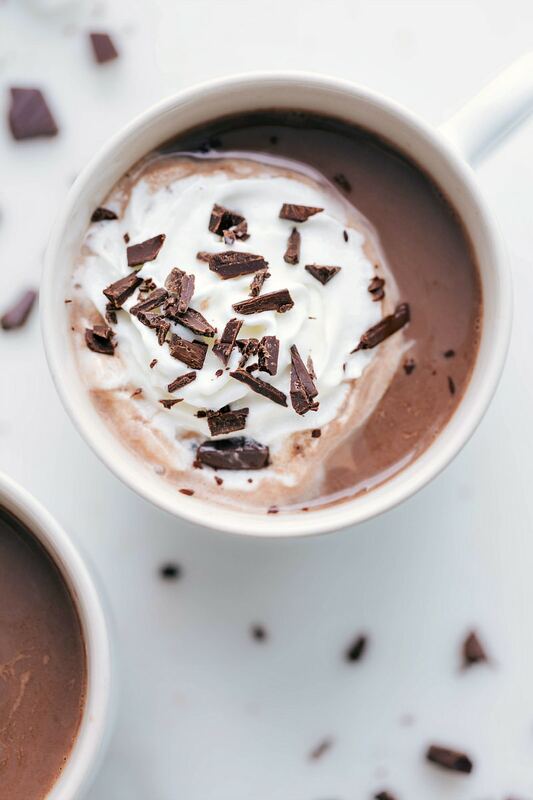 Although hot chocolate packets are easy and convenient, I’m convinced that once you try this hot chocolate recipe, you’ll never want to go back! This cocoa is so fast to make, uses staple ingredients you probably already have, has so much flavor, and is easy to customize. Read on to learn how to make your own hot cocoa and ditch those packets from hot chocolate brands! 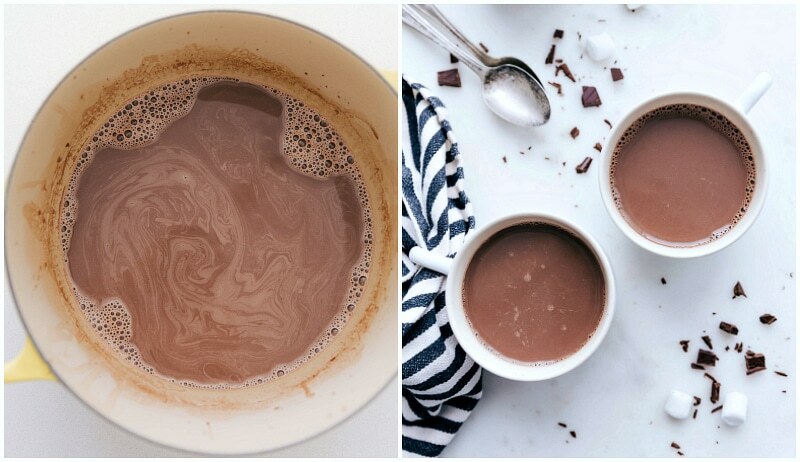 You won’t believe how simple it is to make homemade hot chocolate! 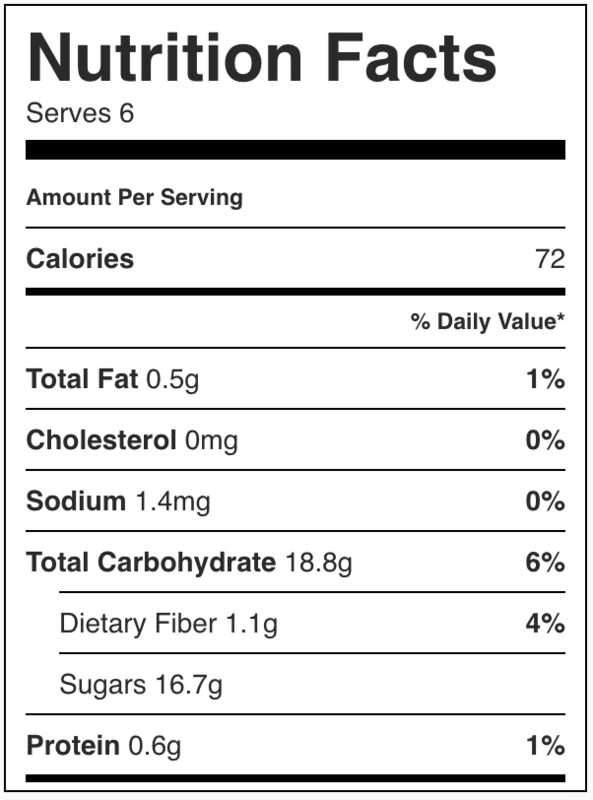 Scroll down to the recipe below for specific quantities and detailed instructions. Is hot chocolate made with milk or water? While you can make hot chocolate with water, it’s much more flavorful and creamy with milk. This recipe calls for milk and I think you’ll agree it’s best with milk! One of the my FAVORITE parts of making hot chocolate is customizing it each time. From mix-ins, to toppings, to sauces, the possibilities are endless. I’ve listed some of my favorites below. Make it spicy: (think Mexican Hot Chocolate): to this batch add about 1 teaspoon ground cinnamon, a pinch of nutmeg, and 1/4 teaspoon (or to taste) of chili powder. Add some spice: a pinch of cinnamon can totally change your cocoa! 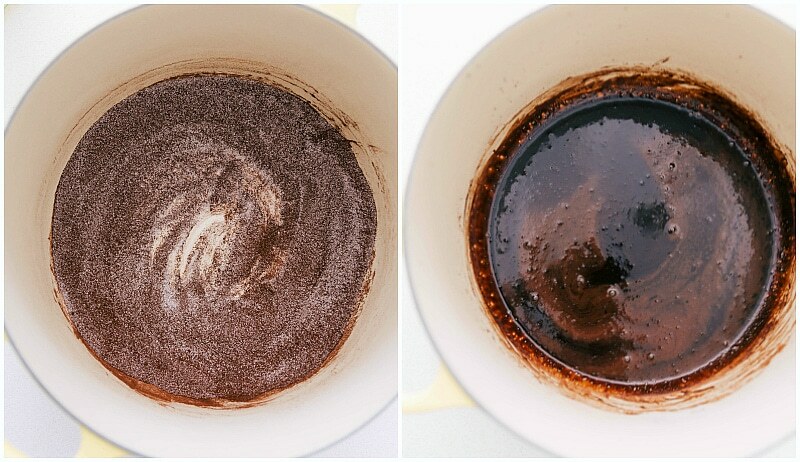 Make dark hot chocolate: use special dark cocoa powder instead of regular. Is it bad to drink hot chocolate? You’ll hear different opinions on this depending on who you ask — some say it’s good, some say it’s bad. Here are the arguments made by both sides (which are all valid arguments)! Reasons it’s good for you: high in antioxidants which help prevent cancer, heart disease, etc. as they fight free radicals in the body (yes the same antioxidants you’re getting from an acai bowl!). Hot chocolate also has a lot of flavonoids which increase the blood flow and oxygen to the brain. (These benefits are for homemade hot chocolate using cocoa powder). Reasons it’s not so good for you: high in calories, fat, and sugar. 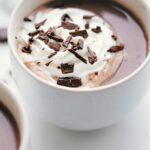 Creamy, dreamy hot chocolate -- you'll never go back to buying mixes or packets after trying this recipe and seeing how simple it is to make! In a saucepan or pot, add in the cocoa powder, sugar, and salt. Whisk. Pour in the hot water and whisk constantly. Bring to a boil, over medium high heat, keep the mixture on a low boil for one minute. Stir in the milk (add to preference -- for stronger hot chocolate add less milk and for a more mild hot chocolate; add more milk. IF desired, add coffee creamer in place of 1/2 cup of milk*). Bring the hot chocolate to your desired heat. 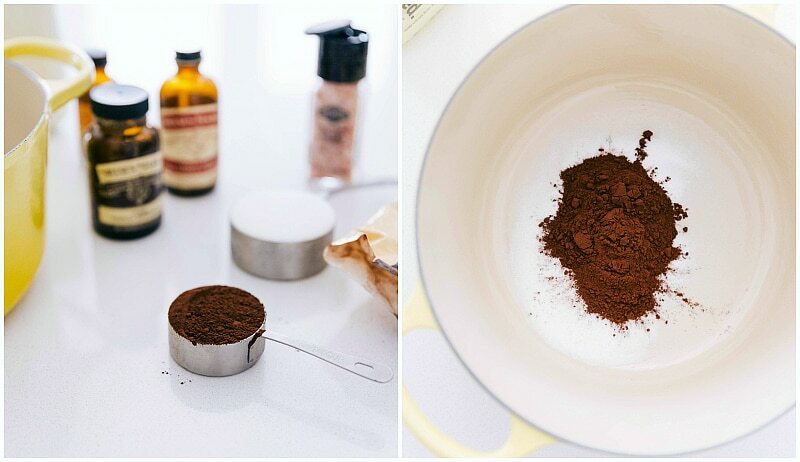 *Everyone's preference for hot chocolate is different and a lot of the end result depends on the cocoa powder you use. This is my favorite cocoa powder. I love 3 and 1/2 cups milk with 1/2 cup coffee creamer, but my kids and husband all prefer 4 cups milk with a splash of creamer. So play around with milk and creamer to get to YOUR perfect hot cocoa! The “mix” is crazy easy — just 1/2 cup granulated sugar and 1/4 cup cocoa powder. If you want to make this ahead of time you can. Whisk together and store it in an airtight container in a cool dark place. Scoop out 3/4 cup whenever you want to make this recipe. In a small pot, whisk together the cocoa powder, sugar, and salt. Add in the hot water and whisk. Bring to a boil and then add in the whole milk. Bring to the temperature you’d like and then remove from heat and stir in the extract. Enjoy while hot. *While I have my background in Exercise and Wellness (BA), all the content in this post is for informational purposes only. Please consult a doctor or dietician for any specific dietary needs/questions. Look so attractive but I highly recommend you to stir more 1 egg yolk then return to heat, stirring constantly and whisk to create foam ( Do not let this boil or the yolk will curdle). Make sure you will love it!! !